Some couples decide to have their wedding at home and I think that this is a great idea. It can add a personal, intimate feeling to a wedding. The only problem is that many times couples think that this is a great way to save money. It can in some areas but many times couples do not think about the costs associated with the home. They end of spending more money then they expected and cannot figure out why. Here are some of the things that you need to think about for a home wedding. 1. How many guests do you have? One of the ways to keep a wedding cost down is to invite less guests. A home wedding in a sense does this for you automatically. The important thing to look at is do you have the space for who you want to invite. Where are you having the ceremony? Do you want your guests to be able to sit? If you are providing a meal, how many people can you sit? If you invite 50 people and you can only sit 30 for a sit down dinner, you are going to have some angry guests. It is important to map out your day and figure out exactly how many people can fit at each event. 2. What items do you have to rent? If you are going to have a sit down ceremony, do you have chairs or benches for all your guest? How about tables for your reception? Do you want a dance floor? Is it going to be at night, can you see? When you have a home wedding you most likely will have to rent everything about the wedding. If you are at a reception site, you get tables, chairs and china provided for you. At home you have to rent everything, down to the salt and pepper shakers on the tables. Lighting is a big element people sometimes forget. If you are having an evening reception in the backyard, you and your guests will probably want to see each other. You are probably going to need to hire a lighting company to give you the ambiance you want. 3. What about restrooms? This is not a glamorous topic but a realistic one. Are you having 50 people at your wedding, but you only have one restroom? Guess what, you are probably going to have a line. Depending on the size of your facilities and the number of guests, you may want to look into renting some extra ones. 4. Are you going to have music? Do you have a power source near by the DJ can use? Do you have a noise ordinance in your area? Nothing is worse than getting the party started just to have it ended. You need to check to make sure that you do not have to stay below a certain sound level at night. You do not want a neighbor to call the police on your wedding day. You may also want to let your neighbors know about the wedding so they are not surprised about the noise. 5. Where is everyone going to park? If you are inviting 50 people, do you have a place for 25 cars? You have to think of where your guests can park. If it is going to be a little bit of a walk, are you providing transportation to and from? Remember, your guests may not want to walk a mile in 3 inch heels. 6. Is your house in shape for a wedding? Many people decide to work on their house when they are having a home wedding. Depending on the shape of your house depends on the costs. Does your house really need a new paint job? Do you need to plant new flowers and bushes? If the ceremony is inside, do you need replace any carpet? You may be saying that you need to do none of these, great! However, many people decide that once a wedding is involved everything needs to be perfect, including the house. It is fine to update your house, but remember these are additional costs you need to add to your budget. 7. What shape will your house be in after the wedding? This is something couples forget to think about. If you are having it outside, you are going to have some yard damage. For example, if you are laying a dance floor down, it is probably going to be layed the day before. Then you have the wedding and it does not get pulled up until the day after. Is your grass going to survive? Probably, but it might need some life support. You are also going to probably have some holes. This is not a complete list of everything you need to think about, just some of the bigger items. You can have a beautiful home wedding that will not break the bank, you just need to think about all the details. What I think that is most important is that a home wedding may require a little more planning then a regular wedding. If your wedding is at a reception site, they are the ones worrying about all the details. At a home wedding, it is you. This may be one of the best times to hire a wedding planner. We are here to help you think about all these details. We are also their to coordinate everything for setup and at the wedding. This can be a huge undertaking depending on what type of wedding you are having. You can do it yourself, just remember details, details, details. Also, stay organized. You will need to know what is happening at all times. If you decide to have a home wedding, enjoy it. This is a unique type of wedding that can add such a personal touch to your special day. 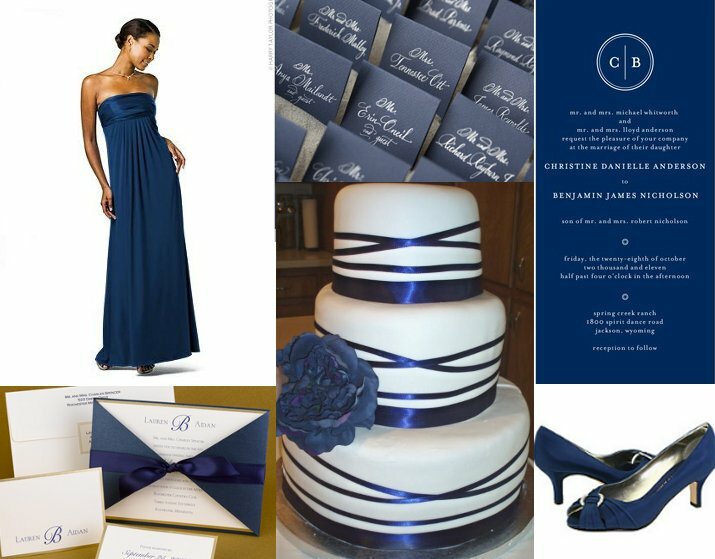 Another hot wedding color for 2010 is navy blue. I really like this color and how rich it makes everything look. I think that you can use this color with any style, but I think that it goes really well if you want a classic feel to your wedding. Pairing it with white adds a beautiful sophistication to this color. Just imagine your bridesmaids holding white roses and tables covered in all white flowers on top of blue linens. You could also easily pair this color with silver to add a little sparkle. Finally, this is a natural color if you want a nautical theme to your wedding. By using this color and some well placed decorations, you could have the nautical feel without the overdone look. This color is going to produce many gorgeous weddings so enjoy!